When Denzel Murdoch was sent to the gallows for strangling a young woman, he shouted that he was innocent and vowed he would come back from the grave and take revenge on the judge, the six jurors and the marshal and deputy who had arrested him. And now it’s happening – Green River’s marshal is discovered in a freshly dug grave with the initials D.M. carved on his brow – and there are more deaths to follow. The townspeople are terrified. 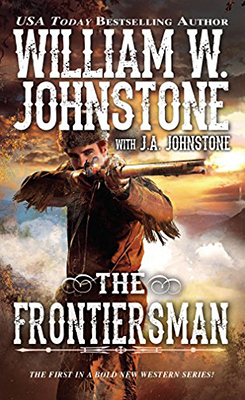 They can only turn to the man they call John Stranger – a mysterious drifter they found in the Green River cemetery after a shoot-out that left three bank robbers dead – a man who can’t remember his own identity after being grazed by one of the robbers’ bullets. All people know about him is that he’s faster with a gun than anyone they’ve ever seen before – and that’s enough. This is another strong entry in what, for me, has been a superb series so far. Each book is a stand-alone title linked by the fact that one, or more, of the main characters wears a badge of some kind. Like the previous books this story has a fairly dark content and the author is very good at describing the grip of fear that begins to motive many of the characters as they try to convince themselves that Denzel Murdoch’s ghost has not risen from the grave to kill those he holds responsible for his death. But what other explanation is there? As terror brings forth desperate acts, can the lawman and John Stranger keep control before mob rule will see more innocents put to death? And what of John Stranger himself? Who is he? A robber? A killer? A lawman? Where is he from and why is he in Green River? Bonnie Bodine, the murdered marshal’s sister, convinces herself that Stranger is a good man and the two begin to fall in love. But is Stranger already married? Are they setting themselves up for the agonizing pain of heartbreak if Stranger does indeed have a wife, a family? Bill Reno packs this story with questions and mysteries that become more and more tangled as the death toll rises. Once you think you may have some idea as to what is going on the author springs more twists to the tale. One of my suspicions did turn out to be correct, kind of, as to the identity of the killer, but Reno had a major surprise in store where that person is concerned that provides another excellent twist that I doubt anyone will see coming. Does Stranger get his memory back? Is he the kind of man who Bonnie would want to spend the rest of her life with? Is he married? Are either, or both of them alive by the end? The quest for Stranger to discover his identity keeps throwing up surprise after surprise – and that is all I can say without ruining this story. Bill Reno is a pseudonym for Lew A. Lacy who once again presents the reader with a hard-hitting, at times brutal tale that is a gripping read. On finishing this book I find myself eager to pick up the next one in the series and to try some of the other westerns he has written, such as a number of entries in the Stagecoach Station series as Hank Mitchum. Big Red and Old Red Amlingmeyer’s dream has come true: The Sherlock Holmes-worshiping cowboy brothers are finally in business as professional detectives. But their fledgling A.A. Western Detective Agency faces a few challenges. Their partner, Col. Crowe, is almost as cantankerous and secretive as Old Red himself. The colonel’s daughter, Diana, insists on tagging along for the Amlingmeyers’ first assignment. And that assignment lands them smack dab in the middle of a range war — with Big Red and Old Red expected to shoot it out with rustlers rather than rustle up clues and solve a mystery. When the violence claims an unexpected victim, however, the Amlingmeyers are called upon to holster their guns (for a moment) and use their “Holmesifying” skills to track down the killer. But someone else is tracking them...someone who seems to set one ambush after another for the brothers. Will the Double-A Western Detective Agency’s first case also be its last? 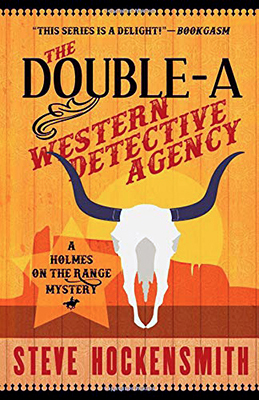 It's been just over two years since the last Holmes on the Range book appeared which was more mystery than western, but this time Steve Hockensmith was writing it for fun rather than a mystery imprint so he decided to ‘pump up the western vibe’. Due to that decision this book certainly reads like a western that contains a couple of mysteries that need solving as only the Amlingmeyer’s can. As usual the story is told through Big Red Amlingmeyer, his many humorous observations making me laugh out loud. The tale seems to be a typical range war type of plot but it soon becomes clear it’s much more than that and it spirals into a twisting and complex storyline that provides Old Red with plenty of opportunity to use his deducifying skills. I can’t really say anymore about that without giving to much away and thus spoiling the book for those intending to read it. The story moves forwards at a fast pace and chapters often end on a cliff-hanger that will keep you turning the pages. There is also plenty of action – standoffs, gunplay, fistfights and other tense situations – that will be enjoyed by all western fans. Something that really caught my attention was the town a lot of the tale takes place in, it’s unusual set up being one I can’t remember reading the likes of before. If you’ve not yet read any of the Holmes on the Range books then this is certainly a great place to jump in as it seems to mark a new beginning for the Amlingmeyer’s due to it being their first assignment for their new Double-A Detective Agency. Let’s just hope that Mr. Hockensmith doesn’t keep us waiting too long to find out what their next job will be. Evelyn King yearns to get hitched. Eager for her dream to come true, she won’t let anything stand in her way. But the frontier has many dangers. Killers and hostiles and beasts abound. As Evelyn is reminded when she and the man she loves run into a pack of two-legged wolves…and something far worse. At last another Wilderness book has appeared, two years after the previous title, The Avenger. Since Leisure Books closed David Robbins has been publishing new Wilderness books under his own name rather than the pseudonym of David Thompson. How I tried to read this book slowly, to savour every word, every scene, but my ambition failed miserably as each short chapter ended with a question or cliff-hanger that made it virtually impossible to put the book down as I just had to know what happened next. 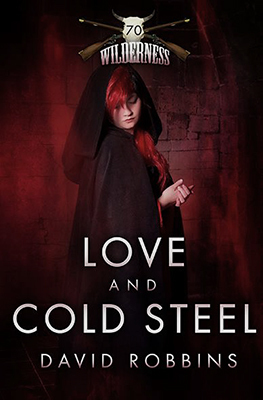 Love and Cold Steel could be described as two separate storylines running parallel to each other – Evelyn and Dega’s dangerous travail to reach Bent’s Fort and hopefully find a preacher to marry them, and the tale of a wagon train and it’s guide, Quay, to solve the mystery of his gruesome discoveries that threaten all the travellers lives – although you know at some point these gripping tales are going to converge in some way that will intensify the already deadly situations the main characters find themselves in. Fans of the Wilderness series, and/or David Robbins writing style will know what to expect in the way the story is told; the how are they going to get out of that scene endings already mentioned, the endless struggle of man and women to understand each other which often results in laugh-out-loud moments, the witty dialogue which again left me grinning much of the time, the desperate savage fights to survive – both against man and beast – which are vividly written and plotlines that will keep you guessing to the end. 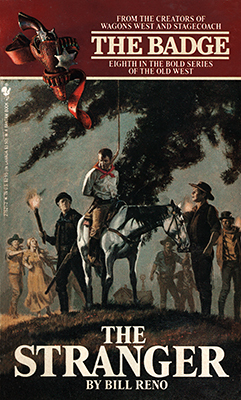 Wilderness 70 might have been a long time coming but it certainly lived up to my expectations and I believe it should be enjoyed by all western fans, especially those who like the mountain man era. All I can hope is that David Robbins doesn’t keep us waiting quite so long before he gives us another instalment in this excellent series.